Product prices and availability are accurate as of 2019-04-17 08:22:03 EDT and are subject to change. Any price and availability information displayed on http://www.amazon.com/ at the time of purchase will apply to the purchase of this product. 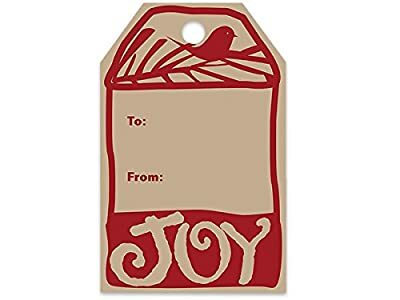 The colorful solid color gift tags are packaged in peggable poly bags. The printed design tags are shrink wrapped. Great for use on your gift baskets, gift bags, and wrapped gifts. Tags have pre-punched hole for attaching to gifts with ribbons. Available in assortments of solid colors as well. Woodcut Christmas die cut gift tags with hole for ribbon. The colorful solid color gift tags are packaged in peggable poly bags. The printed design tags are shrink wrapped. Great for use on your gift baskets, gift bags, and wrapped gifts. Tags have pre-punched hole for attaching to gifts with ribbons.